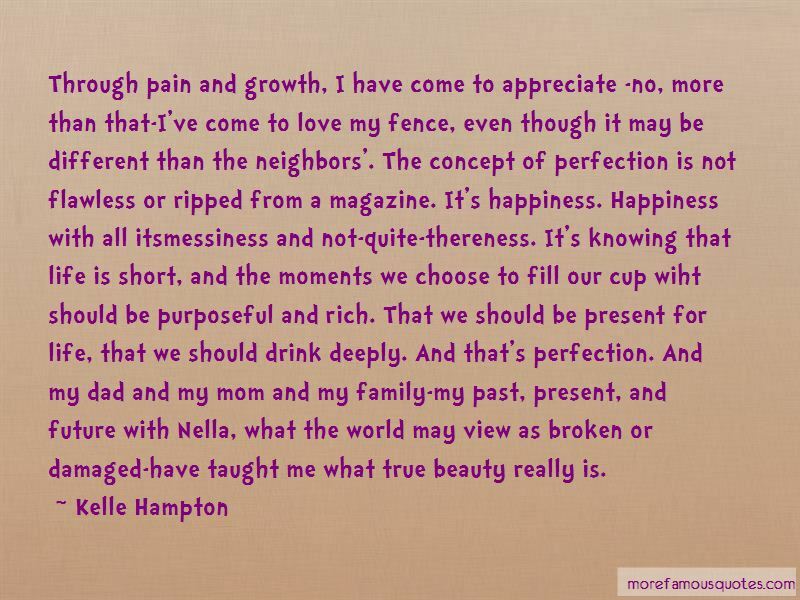 Enjoy reading and share 43 famous quotes about True Family Love with everyone. “The truth is women need men, we are neither superior nor inferior to men. We are better at some things and worse at other things. Mature people take the hard road and choose to delay quick gratification for true love. Mature people realize that the world does not revolve around them, and their desires, but around commitment. Mature people are committed to something beyond themselves; God, good, the good of society, family etc. “All people know the Greater Hunger ... It is the hunger for warmth, for family, for connection to the stars and the earth and other living things ... "
“You didn't want to put in the work to make us happen. It was true. I had been so captivated by Duncan, so enamored, so infatuated, that I let his life drown mine for two years. I went along, and when I got tired of it, tired of it just being easy and comfortable and convenient but not love, I ended it. And that was why I had the man in my lobby looking at me like there were still places for us to go. I had let him believe that he was my whole world, let him be everything, and then one day just stopped loving him and walked away. It was something I did, something I had always done-poured on the charm, made myself into the ideal partner, lover, friend, indispensable and irreplaceable, and then, when I got bored or tired or tapped out, instead of fighting, I just quit. It was wildly unfair, and the only people I didn't do it with were my family. Even my friends complained that I was always around and then just gone. 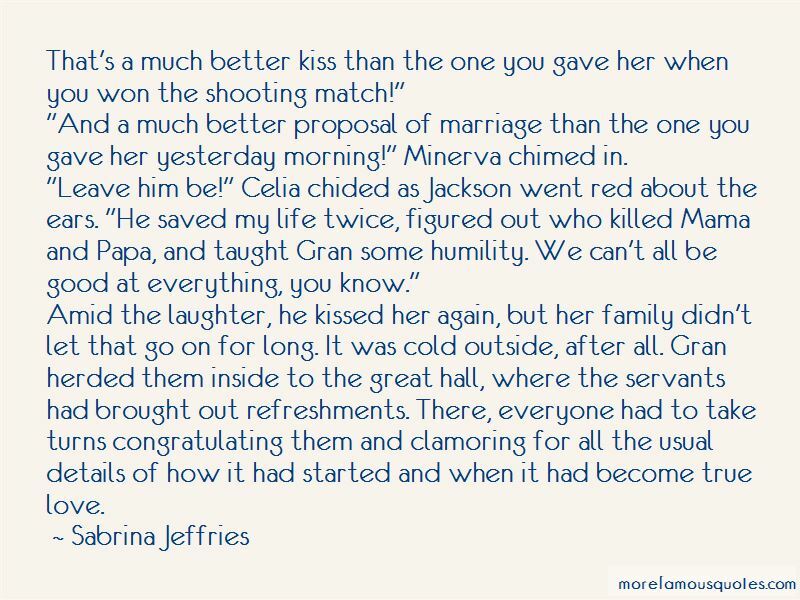 “That's a much better kiss than the one you gave her when you won the shooting match!" "And a much better proposal of marriage than the one you gave her yesterday morning!" Minerva chimed in. "Leave him be!" Celia chided as Jackson went red about the ears. "He saved my life twice, figured out who killed Mama and Papa, and taught Gran some humility. We can't all be good at everything, you know." “The problem, Mitch, is that we don't believe we are as much alike as we are. Whites and blacks, Catholics and Protestants, men and women. If we saw each other as more alike, we might be very eager to join in one big human family in this world, and to care about that family the way we care about our own. But believe me, when you are dying, you see it is true. We all have the same beginning - birth - and we all have the same end - death. So how different can we be? Invest in the human family. Invest in people. Build a little community of those you love and who love you. Want to see more pictures of True Family Love quotes? 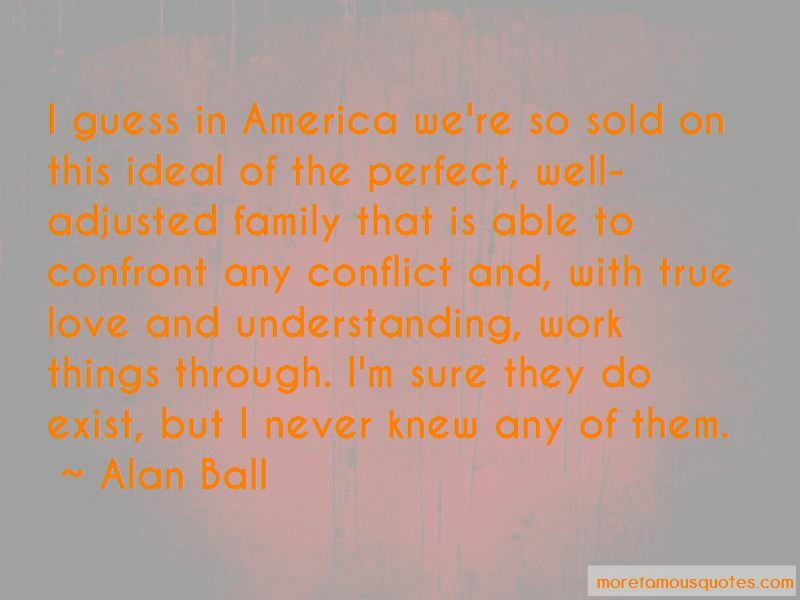 Click on image of True Family Love quotes to view full size.